Kudos to Honda who release their first car known as FCX clarity which is run on fuel cell and hydrogen only. 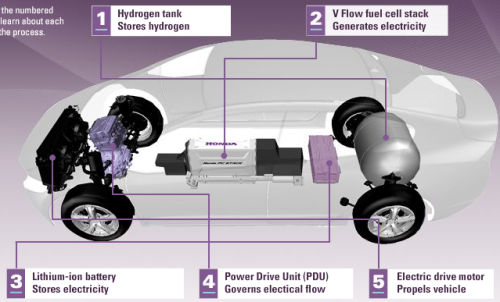 It’s impressive considering that the fuel cell combines hydrogen with oxygen to make electricity which in turn powers the electric motor to propel the vehicle. Water is the only byproduct the FCX Clarity leaves behind. I sure hope this kind of green car can be in mass production in the near future and reduce our dependence on fossil fuel to power our transportation system.